NASA established the TDRS project in 1973 to provide around-the-clock and around-the-Earth communications for the network that routes voice calls, telemetry streams and television signals from the International Space Station, as well as other orbiting spacecraft. NASA plans to launch a new satellite today (Jan. 30) to upgrade the network used to send messages back and forth between spacecraft and the ground. The space agency is set to launch the new Tracking and Data Relay Satellite K (TDRS-K for short) at 8:48 p.m. EST (0148 Jan. 31 GMT) today from Cape Canaveral Air Force Station in Florida. 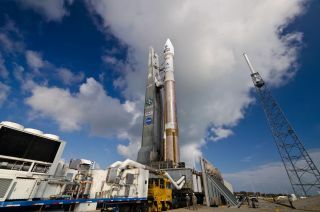 The spacecraft will blast off atop a United Launch Alliance Atlas 5 rocket. You can watch the launch live on SPACE.com through NASA TV starting at 6:15 p.m. ET (1115 GMT). Weather at the launch site is looking promising, but NASA officials aren't taking any chances, and won't launch the rocket unless skies are clear. "Now we're looking at a 40-percent chance that a weather rule will be violated," Joel Tumbiolo, a NASA launch weather officer, said on Monday. The rocket that will carry TDRS-K to orbit has already been rolled out onto the launch pad, but a cold front is approaching Cape Canaveral that could delay the launch. Electrically active clouds heralding the arrival of the cold front might create dangerous conditions. In the Astrotech payload processing facility in Titusville, Fla. near NASA’s Kennedy Space Center, a Boeing technician checks out the Tracking and Data Relay Satellite, TDRS-K. This image was released Jan. 11, 2013. Thanks to the positioning of ground elements and the TDRS network of satellites around the world, NASA scientists have constant communication with orbiting spacecraft. The network is responsible for space-to-ground communication with the International Space Station as well as the Hubble Space Telescope. The TDRS-K satellite is expected last at least 15 years in orbit. It is the 11th TDRS spacecraft to launch since the network was started in 1983. Today, five satellites are in active service, but one might be retired once TDRS-K is placed in orbit, said Badri Younes, a scientist in NASA's Space Communications and Navigation office. The Atlas 5 rocket will boost the new satellite into an orbit 22,300 miles (35,888 kilometers) high, where it will join a network of other relay spacecraft above the planet. Once out of Earth's atmosphere, the rocket's main engine will separate and fall away, leaving a second-stage centaur rocket engine to carry the 26.7-foot-tall (8 meters) satellite into orbit. The TDRS-K has two insect-like antennas that are folded during launch. Once the satellite detaches from the rocket's second stage, its antennas will pop out into a bowl shape. After 10 days of maneuvering into its proper orbit, TDRS-K's two solar arrays will unfurl and the antennas will lock into place. After launch, NASA will test the satellite for three months to make sure everything is in working order. Once those tests are complete, the TDRS team will decide if the satellite is ready for service (if not, it will be moved to a backup position).